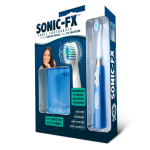 The Sonic-FX™ Solo Sonic Toothbrush is a great way to ensure that your whole household will get the proper twice-a-day tooth brushing that is recommended by dentists. 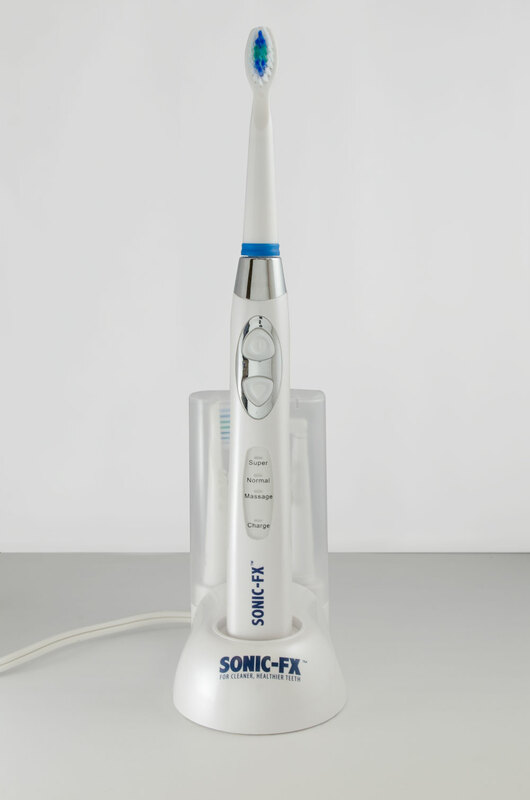 Sonic technology and proprietary brush heads combine to give you whiter teeth, healthier gums, a cleaner, fresher mouth and superior plaque removal. 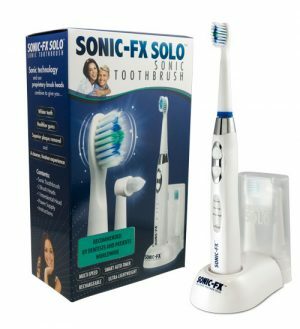 The Sonic-FX Solo toothbrush is capable of over 33,000 strokes per minute, is ultra-lightweight and rechargeable, has twist-and-lock brush heads for quick and convenient changing, and 3 different speeds. The intelligent timer has a 2 minute shut off, separated by 4 30-second intervals, in order to ensure optimal brushing time is reached. In addition to 2 brush heads, the Sonic-FX Solo also comes with 1 interdental head, designed to clean hard to reach spots. The interdental head helps prevent gum disease by getting rid of pieces of food and plaque from between your teeth. Multi-Speed: Normal for daily cleaning; Super for enhanced plaque removal and whitening; Massage for gum stimulation. Sonic-FX Solo Sonic Toothbrush comes with a 90-day warranty. If found defective within the first 90 days, contact us and we will repair or replace the unit to your satisfaction.